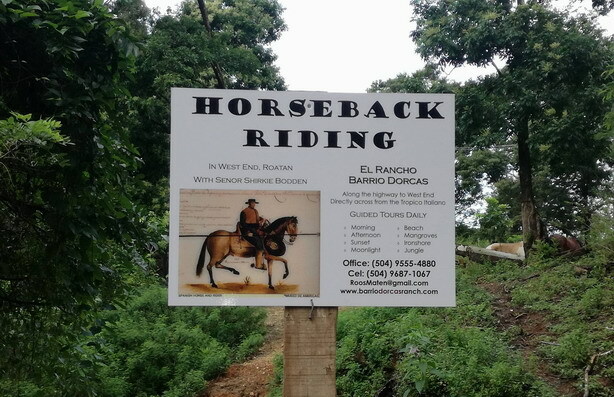 El Rancho Barrio Dorcas is situated along the highway that comes from Coxen Hole passing through Sandy Bay to West End. West End is one village southwest of Sandy Bay. If staying in Sandy Bay, you will have to make your way to the main road from where you are staying. The main road has the ocean on one side and the high land on the other. Make sure you are going southwest, with the ocean on your right and the high land on your left. You are about a mile or so from the ranch when you see on your right-hand side a sign for the "Gibson Bight Marina". Your next landmark will again be on your right – a white 7th Day Adventist Church at the juncture of Mangrove Bight Road. Keep going straight; shortly after you will pass a clay coloured apartment complex. We are located around the next bend in the road on your right-hand side. 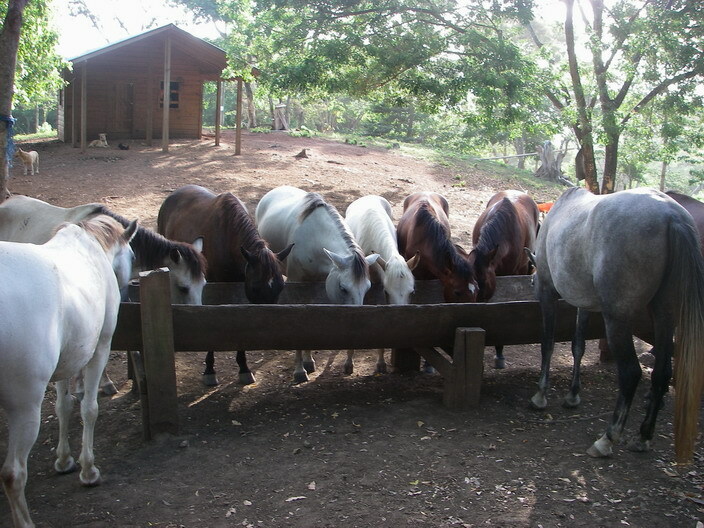 Provided you have reserved, you will see the horses on your right, either by the side of the road or under the barn. You can enter the gate here. If you pass a gas station on your left, you have gone too far. Just turn around - we are just a little ways back from the gas station. Look out for a yellow-orange mansion on your right surrounded by a stonework wall. 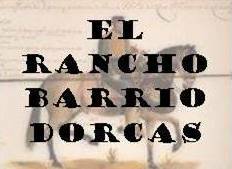 The ranch is just beyond, on your left. If you are in West End, we are about a 15 minute walk up the highway in the direction of Coxen Hole from the circle that marks the entrance to West End Village. It is about 3/4 of a mile, not far after the gas station. Look out for a yellow-orange mansion on your right surrounded by a stonework wall. Look out for a yellow-orange mansion on your right surrounded by a stonework wall. If driving, you can park right in front of the arched gate and walk along the road until you see our sign on your left (just before the next curve in the road). If in a taxi, have him drop you off at the sign. This is the entry gate to the ranch. Go to where you see the saddled-up horses. Taxis from West Bay can be pricy in comparison to other locations on the island. A pleasant alternative would be to come to West End by water taxi. At the time of writing, the cost for the water taxi is $3 (50 Lempiras). There are several locations on the beach in West Bay where you can get one. It is but a short mini-bus ride from the water taxi stop. These buses pass every 15 minutes. Stand on the land side of the street, so you catch the bus going out of West End (ocean on your left). Just flag one down and one dollar or Lps.20 will get you to the ranch, which is located not far after the gas station. Look out for a yellow-orange mansion on your right surrounded by a stonework wall. The ranch is on the left hand side of the road. Keep going along the road until you see our sign on your left (just before the next curve in the road). If in a taxi or bus, have the driver drop you off at the sign. This is the entry gate to the ranch. Go to where you see the saddled-up horses. This option does take longer, since you must wait for the water taxi and the bus, so factor in some extra travel time. Take the West Bay road (there is only one main road). This road ends in a "T" where it meets the Flower's Bay road. Turn left here in the direction of West End. After about 2 or 3 miles, this road also ends in a "T". Turn right at this point (direction Sandy Bay / Coxen Hole). The ranch is about 3/4 of a mile along this road. Shortly after the gas station that you will pass on your right, the road veers to the right and you will go up a steep hill. At the top of the hill, you will see a yellow-orange mansion surrounded by a stonework wall. If driving, you can park right in front of the arched gate and walk along the road until you see our sign on your left (just before the next curve in the road). If in a taxi, have the driver drop you off at the sign. This is the entry gate to the ranch. Go to where you see the saddled-up horses. Take the road that goes from Flowers Bay to West End. At one point, you will arrive at a triangle. Don't turn left here, stay going straight ahead. About 2 or 3 miles farther, the road ends in a "T". Turn right at this point (direction Sandy Bay / Coxen Hole). The ranch is about 3/4 of a mile along this road. Shortly after the gas station that you will pass on your right, the road veers to the right and you will go up a steep hill. At the top of the hill, you will see a yellow-orange mansion surrounded by a stonework wall. If driving, you can park right in front of the arched gate and walk along the road until you see our sign on your left (just before the next curve in the road). If in a taxi, have him drop you off at the sign. This is the entry gate to the ranch. Go to where you see the saddled-up horses. You will need to ask directions from someone where you are staying as to how to get to the main road (Carretera Principal). Once there, drive southwest towards Coxen Hole, and follow the directions FROM COXEN HOLE AND SANDY BAY.